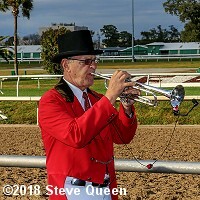 Fair Grounds Race Course in New Orleans hosted its "Road to the Derby Kickoff Day" card on Saturday with five stakes races. Conditions were cloudy with temperatures in the high 50's, after rain earlier in the day downgraded both the main track and the Stall-Wilson turf course to good. The highlight of the afternoon was the $200,000 LeComte Stakes (G3) for 3-year-olds going 1 mile 70 yards on the main track. The race is a points-scoring race in the Road to the Kentucky Derby series, the points system used to determine Derby starting spots. War of Will was sent off as the 8-5 favorite in the field of 12 off a maiden win after finishing 5th in the Breeders' Cup Juvenile (G1). 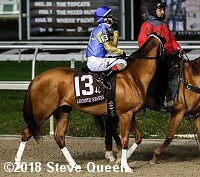 In to challenge him included 4-1 second choice Plus Que Parfait, second in the Kentucky Jockey Club (G2), and 6-1 third choice Tight Ten, 9th in the Breeders' Cup Juvenile after finishing second in the Iroquois (G3). 18-1 Malpais and 10-1 Manny Wah dueled for the lead first time by and around the clubhouse turn through opening fractions of 24.33 and 49.22 while stalked by War of Will and 53-1 Wicked Indeed. On the far turn Malpais tired as War of Will moved up to lead through 3/4 in 1:14.63. Entering the stretch, War of Will opened up on the field through 1 mile in 1:39.50. 13-1 Hog Creek Hustle, 8th early under Florent Geroux put in a strong 7 wide rally but War of Will, kept to task by Tyler Gaffalione, drew off to win by 4 lengths in 1:43.44. It was another 2 lengths back to Manny Wah third. Left: War of Will in the winner's circle. 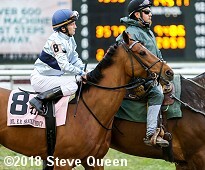 Winning trainer Mark Casse (far left) said, "This was about a month ago, but I had some friends over and I said �We have a big chance to win the Derby this year.� I don't usually say things like that, so that tells you what I think of him. I'll talk to (owner) Gary (Barber) but (the Risen Star Stakes) would make the most sense, it's why we're here. We love this place and it's a great place to get a horse ready. I don't know that there would be a real reason to leave." Right: War of Will in the post parade. Winning jockey Tyler Gaffalione said, "My horse broke sharp. It looked like (Manny Wah) had a little more speed going into the turn and I took him back and went to his outside to try and get the best trip possible. He relaxed for me on the backside and when they came down to run, he really turned it on." Shortly after the start of the Lecomte Stakes with War of Will in the center. Left: Second place finisher Hog Creek Hustle heads out to the track before the race. 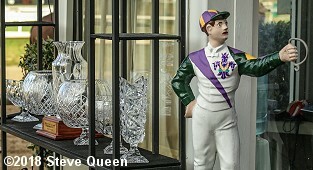 Jockey Florent Geroux said, "I wish I had some more horses in front of me to follow. I was following some horses who stopped right behind War of Will, and by the time we got out the winner was gone." Right: Third place finisher Manny Wah in the post parade. 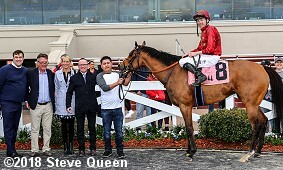 Jockey Channing Hill said, "Beautiful trip, and a great little horse. Every time he runs, he runs his heart out, and today he made it look easy to get into position from a tough post. He punched hard � the winner ran a monster race." 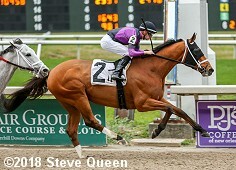 The distaff counterpart to the Lecomte is the $150,000 Silverbulletday Stakes for 3-year-old fillies also going a mile and 70 yards on the main track and scores 10 points in the Road to the Kentucky Oaks. Grandaria was sent off as the 3-2 favorite in the field of 7 off consecutive wins in allowance company and making her stakes debut here. 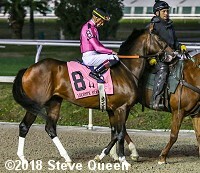 In to challenge her included 5-2 second choice Needs Supervision, an allowance winner last out, and 7-2 third choice Liora, winner of the Golden Rod Stakes (G2). 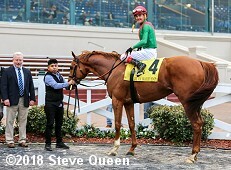 Jockey Brian Hernandez Jr. sent 13-1 Fun Finder to the lead first time by and she set fractions of 24.12 and 49.57 while pressed by Liora and stalked by Needs Supervision. On the far turn Fun Finder tired as Liora gained the lead through 3/4 in 1:15.83. Entering the stretch, Liora faded as Needs Supervision, 4 wide under Joe Rocco Jr., moved up to lead thrugh 1 mile in 1:41.22. 31-1 longest shot Eres Tu rallied from 4th early but Needs Supervision held her off by 3/4 length in 1:45.34. It was a long 5 1/4 lengths back to late-running favorite Grandaria third. Left: Needs Supervision in the winner's circle. Winning trainer Jeremiah O'Dwyer said, "I was confident because of the type of filly she has been from day one. It was different bunch today while stepping up in class against nice fillies, and she proved today she can handle any surface. I'll have to discuss [the next step] with the owners." Right: Needs Supervision returns after the race. Winning jockey Joe Rocco Jr. said, "I more or less stayed out of her way. She stumbled leaving the gate, and I was a little worried then, but she picked herself up right away and put us in a good spot." Left: Second place finisher Eres Tu in the post parade. Jockey Ricardo Santana Jr. said, "We got a good trip. 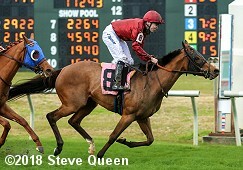 The boss (Steve Asmussen) had a lot of confidence in her, and she ran her race today. We expected that she would show up and she would try, and she did. She ran good." Right: Third place finisher and beaten favorite Grandaria in the post parade. 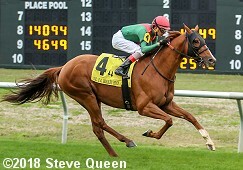 Jockey Corey Lanerie said, "I sat behind the pace, and when I called on her, she gave me what she had. Today we couldn't get there." The fillies break from the gate for the Silverbulletday Stakes. A field of 5 older horses went to post in the $125,000 Colonel E.R. Bradley Handicap at about 1 1/16 miles on the turf. 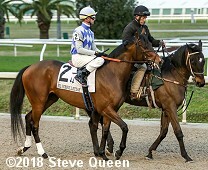 Dilberto Memorial Stakes winner Great Wide Open was sent off as the 3-5 favorite over 5-2 First Premio, unraced since 5th in the King Edward (G2) last June, and 5-1 Pioneer Spirit, 5th in the Tenacious Stakes. Jockey James Graham sent Great Wide Open to the lead first time by and he set fractions of 22.52, 47.05, and 1:11.71 while pressed by Pioneer Spirit and stalked by First Premio. Turning for home Great Wide Open tired as First Premio gained the lead through 1 mile in 1:36.01. Kept to task by Brian Hernandez Jr., First Premio drew off late to win by 3 1/2 lengths over 9-1 Sir Dudley Digges in 1:42.17. It was a neck back to favorite Great Wide Open third. Left: First Premio heads to the winner's circle. Winning trainer Mark Casse said, "He got really sick after his last race. We never found out what happened to him, but he didn't run well and then was sick for a couple of weeks. We played around with him for a bit and finally just sent him home and gave him some time. At this time last year, I thought this was a serious horse, and what he did today was pretty impressive." Right: First Premio heads out for the post parade. 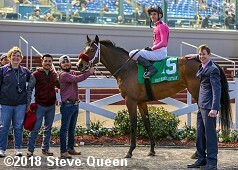 Winning jockey Brian Hernandez Jr. said, "Mark, (assistant trainer) David (Carroll), and the whole team did great with the horse. This was the first time I got on him, and he was there for me the whole way. All I had to do was give him a clean trip and he did the rest." Left: Second place finisher Sir Dudley Digges in the post parade. 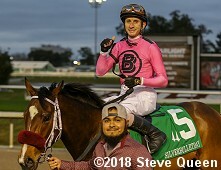 The Mike Maker trainee and 2016 Queen's Plate winner improved his record to 7 wins, 8 seconds, and 5 thirds in 29 starts, earning $934,424 for owners Ken and Sarah Ramsey. Right: Third place finisher and beaten favorite Great Wide Open in the post parade. 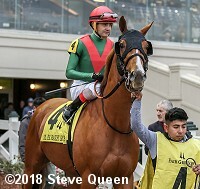 The Conor Murphy trainee improved his record to 7 wins, 6 seconds, and 5 thirds in 39 starts, earning $479,543 for owners M and J Thoroughbreds and Riverside Bloodstock. Kicking off the Saturday stakes sextet was the $75,000 Marie G. Krantz Memorial Stakes, with a field of 8 older fillies and mares also going about 1 1/16 miles on the turf. Blushing K.D. 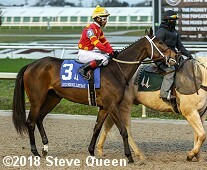 Stakes third place finisher Dubara was sent off as the 9-5 favorite over 7-2 Lion in Wait, winner of 2 straight allowance races, and 4-1 Kabella, 4th in the Mrs. Revere Stakes (G2). 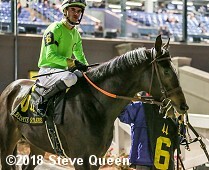 Jockey Colby Hernandez sent 11-1 America's Tale to the lead first time by and she set fractions of 23.87 and 49.24 while pressed by 9-1 Hachi and stalked by 56-1 longest shot Promise of Spring. On the far turn, Hachi took over the lead through 3/4 in 1:13.85. Dubara, last early under Jamie Spencer, came out 4 wide into the stretch to gain the lead through 1 mile in 1:37.48. 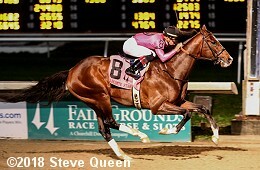 Kept to task by Spencer, Dubara outfinished Promise of Spring to win by 3/4 length in 1:43.47. It was another 1/2 length back to 5-1 Hanalei Moon third. 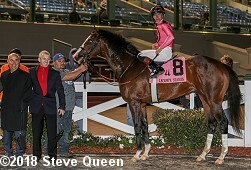 Left: Dubara in the winner's circle. 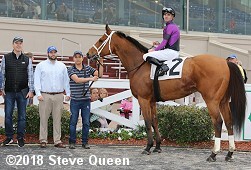 Winning trainer Brendan Walsh said, "Jamie gave her a great ride, and the race panned out perfectly for her. She hit the front at the right time. She was always going to win [a stake], it was just a matter of it setting up right." Winning jockey Jamie Spencer said, "Brendan's got the key to her. She was difficult in the stalls in Europe. Today she was very relaxed � the pace was on and it worked out well." Right: The trophies for LeComte day on display. 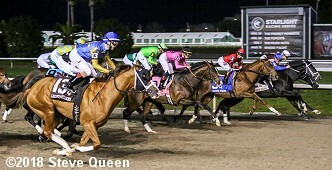 A field of 6 older horses contested the $75,000 Louisiana Stakes over 1 1/16 miles on the main track. 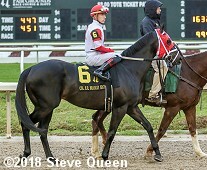 Stephen Foster Handicap (G1) runner-up Honorable Duty was sent off as the even-money favorite over 3-1 Harlan Punch, 2nd in the Jeffrey Hawk Memorial, and 11-2 Silver Dust off an allowance win. 5-1 Snapper Sinclair dueled for the lead with Harlan Punch through fractions of 24.63, 49.68, and 1:14.31. Entering the lane, Snapper Sinclair tired allowing Harlan Punch to inherit the lead through 1 mile in 1:38.66. Kept to task by Florent Geroux, Harlan Punch held off late-running Silver Dust by 3/4 length in 1:45.05. It was another 2 3/4 lengths back to 13-2 Phat Man third. Left: Harlan Punch in the winner's circle. Trainer Brad Cox said, "It worked out really well. He's a very honest, hard-knocking horse. We picked him up in November and he seems to be very honest and a very good workhorse. We're real proud of him." 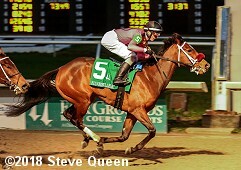 Winning jockey Florent Geroux said, "I try to put them in the right spot and be a good passenger. He has good tactical speed and has been running great in his past few races. He's been training well, and we were very confident and hoping he would deliver this kind of performance." Right: Although there has been racing in New Orleans as early as 1838, the first race card held at the Fair Grounds under the auspices of the Louisiana Jockey Club was in 1872.